It’s been a while since we last posted on this blog. The reason is simple enough. We’ve been very very busy. January is always a highly dynamic time for bookings (and has certainly proved to be so once again), but this year, an exciting – and at times exhausting – element has required our attention. 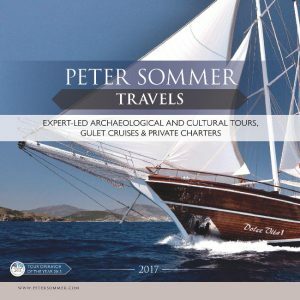 We are launching a new facet of our activities: Peter Sommer Travels in German! During our 14 years of organising gulet cruises and escorted tours in Turkey, Greece and Italy, we have not remained unaware of the potential opportunities presented by the German-language market. More foreign travel (in absolute numbers) originates from Germany than from any other country in the world. German visitor numbers are among the most significant in the three countries we currently cover (Turkey, Greece and Italy), and German speakers have a long tradition of active cultural travel in those areas and beyond. The fact that the occasional German, Austrian or Swiss guest has already participated in our English language escorted tours speaks for itself. Recent years have seen a considerable increase in the range of trips we offer and a steady growth in the number of guests who choose to travel with us. So, the time is ripe for this new departure (in every sense of that word), especially as Heinrich has joined our permanent staff last year. He looks forward to guiding his first tour in German (see below). If you have enjoyed his guiding in English, fear not – he will continue to do so. This is a major step, and one that was long in the making. We know, of course, that a number of highly respectable and well-known cultural travel specialists have been active in the German-speaking countries for a long time, and we wish them well. But we also believe that our very own flavour of painstakingly and lovingly prepared trips, mixing intense cultural experience with supreme relaxation, but especially with in-depth guiding by true experts, offers an interesting alternative in a highly specialised field. The fruit of our labours (and those of our new friends at ExpertPR) are now tangible: A German website, which will grow over time, a German brochure, and our very first expert-guided cruise in German, an archaeological Turkey tour from Bodrum to Ephesus, on September 1st to 8th, 2012. So, if you know any German speakers who would enjoy our escorted tours in Turkey, Greece or Italy, please let them know! And if any German, Swiss or Austrian reader is reading this blog: Guten Tag, Grüezi und Servus, vor allem aber Willkommen! Wir würden uns freuen, wenn Sie einen Blick auf unser deutschsprachiges Angebot werfen, z.B. auf unsere Türkei-Rundreisen, oder natürlich auf unsere englisch geführten Reisen.